Dickey’s tenth novel is packed with twists and turns, filled with titillations and poignancy. 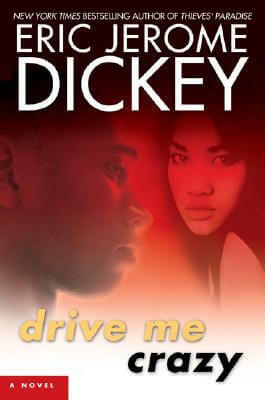 Drive Me Crazy is the latest example that "Dickey is an excellent writer at the top of his game." (Chicago Defender) After his blockbuster holiday novel, Naughty or Nice, New York Times bestselling author Eric Jerome Dickey is serving up his new novel with style, sexiness, and a bit of grit. "Driver" is an ex-con trying to make his life right but who shares an expensive secret and a past affair with his boss’s wife-a woman who is nothing but trouble. Dickey’s rich characters jump off the page, making readers feel as if they are present in the hustle-filled pool hall, the bedroom, and the Lincoln Town Car that Driver chauffeurs his wealthy and notorious clients around in. Dickey’s millions of readers will be happy to see the reappearance of a femme fatale from Thieves’ Paradise, who adds spice and surprises every time she turns up. This is Dickey writing at his best-a fast-paced novel of raw emotions, softened as always with his incomparable humor and characters you will always remember. Tell us what do you think about Drive Me Crazy.